The massive blaze which engulfed three of the Kemaman Bitumen Company’s (KBC) giant crude oil tanks at the KBC industrial area in Telok Kalong here for the past three days, has been successfully extinguished last night. Terengganu Fire and Rescue Department director Azlimin Mat Noor said the firefighters managed to extinguish the fire at 6.40pm using the direct dousing method. “We have also conducted monitoring using drones. (In fact,) we did not spot anymore fire from above and had used ‘thermo x-ray’ to see whether or not there was fire,” he told reporters when met at the industrial area here last night. Azlimin said they would pour water into the storage tanks to reduce the heat and prevent reignition of the fire. “We will continue to monitor (the situation). We will also brief the KBC Emergency Response Team to monitor and report to us. “The investigation will be conducted soonest possible. 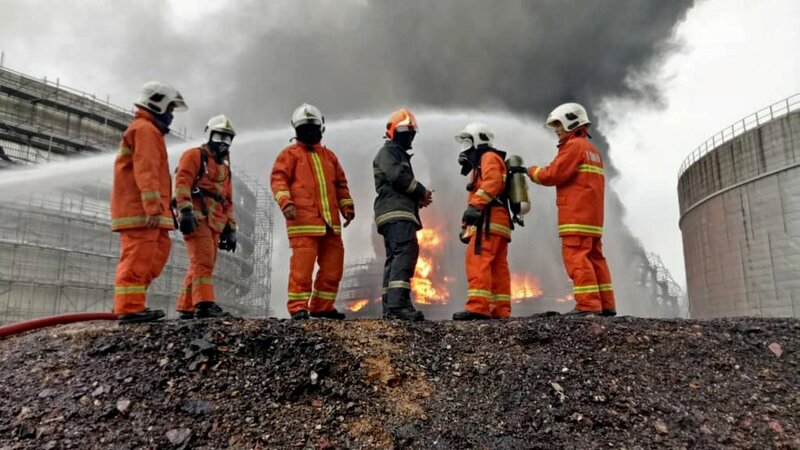 Since this is a major fire incident, a team from Putrajaya will carry out the probe with assistance from state fire department officers,” he said. Azlimin added that the incident was one of the biggest in the country with similar cases in Segamat and Tanjung Langsat in Johor and Port Dickson, Negeri Sembilan in the past.